Figure 1. Southern Doji pattern. This article is devoted to the Southern Doji one-line pattern. The Southern Doji is a pattern belonging to the group of one-line patterns. Its basic candle is any doji candle type, except the Four-Price Doji because at least one shadow is required. A downtrend is required prior the occurrence of this pattern. Southern Doji may reverse a downtrend or slow it down. After pattern occurrence, it is recommended to wait for its confirmation. 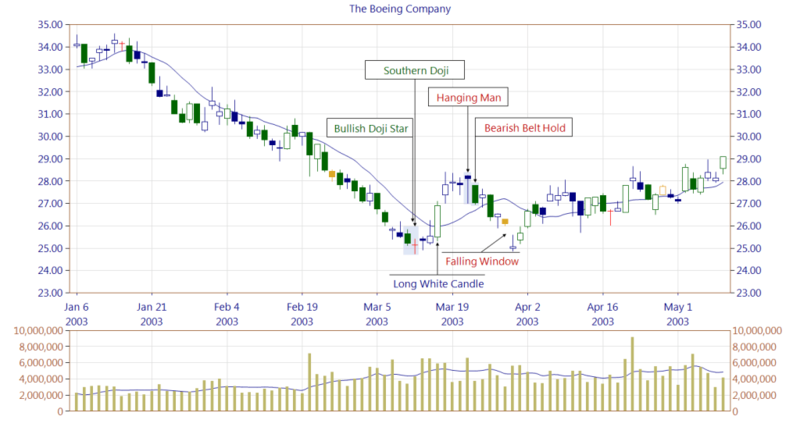 The Southern Doji pattern may occur on the same candle line in combination with another pattern, for example, Bullish Doji Star, or on the second candle with the Morning Doji Star pattern. Such situation reinforces the strength of the signal. The pattern composed of multiple lines is considered as a stronger one. Figure 2. 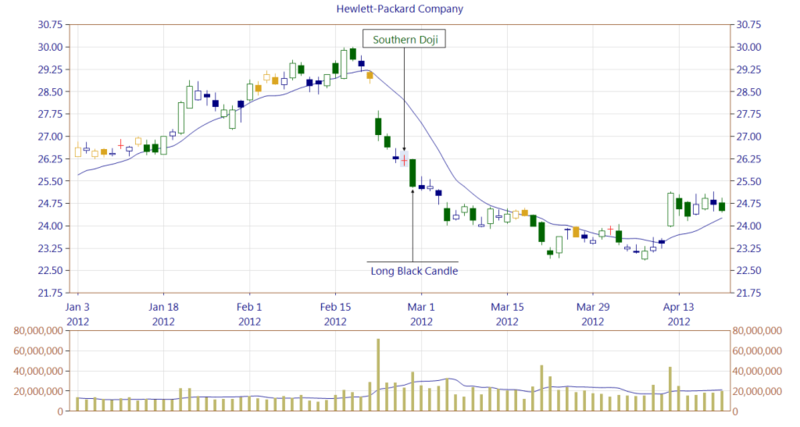 Chart presents how the Long Black Candle canceles the occurrence of Southern Doji pattern. Figure 3. Chart presents the occurrence of Southern Doji pattern formed within the second line of Bullish Doji Star pattern. Long White Candle confirmed both patterns (high trading volume) and created a support zone. Below you can find some Southern Doji pattern statistics calculated by CandleScanner software. To see more detailed statistics, for other markets and periodicity try our CandleScanner software. Prices start at only $10, and you can see more detailed statistics, for other markets and periodicity. Click here to find out more!